Photo courtesy of the Atlanta Community Food Bank. Founded in 1985, MAZON: A Jewish Response to Hunger is the only national Jewish organization dedicated solely to the issue of hunger. Recognizing that poverty and hunger affect all people, MAZON allocates donations from the Jewish community to prevent and alleviate hunger among people of all faiths and backgrounds. MAZON (“food” in Hebrew) has evolved into a leader in the national anti-hunger movement. Since its beginning, MAZON has granted more than $40 million to emergency food providers, food banks, multi-service organizations, and advocacy groups which seek to address the systemic causes of hunger and poverty, both domestically and globally. 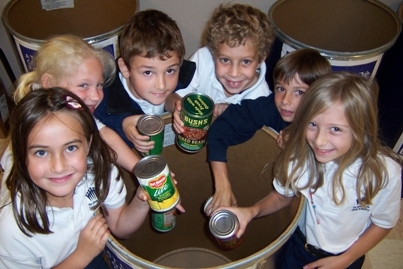 A major component of MAZON’s mission is educating the Jewish community about its obligation to end hunger and its causes. This is accomplished through partnerships with rabbis and other professional staff of synagogues throughout America. These partners stress the importance of hunger-relief efforts to their congregants and to the broader community by providing innovative educational materials produced by MAZON. Historically, rabbis did not allow celebrations to begin until the community’s poor and hungry people were seated and fed. MAZON offers Jews a symbolic way to observe this tradition by facilitating the donation of 3% of the cost of lifecycle celebrations, such as bar/bat mitzvahs, weddings, anniversaries and other joyous occasions, to help feed those who are less fortunate. MAZON has been formally endorsed by over 850 synagogues nationwide, as well as by the Reform, Conservative, Reconstructionist, and Modern Orthodox Jewish movements, Hillel International, and a broad spectrum of Jewish organizations represented on our National Advisory Board. Through its work, MAZON has established itself as one of the leading national organizations in anti-hunger advocacy and social change. MAZON’s public policy work and direct hunger-relief grantmaking give life to the Talmudic commandment to feed the poor and the stranger. MAZON mandates that potential grantees demonstrate significant involvement in anti-hunger advocacy and public education. Grantees include direct service providers, whose natural inclination is to focus on the immediate task at hand (i.e., feeding needy populations) and to view as secondary the emphasis of their role as advocates in promoting long-term change. In its more than two decades of existence, MAZON has empowered both the Jewish community and the broader anti-hunger community to view public policy and advocacy as front-burner issues worthy of an investment of resources. It has accomplished this not only by providing critical funding, but also by providing the leadership that enabled synagogues, individuals, and hunger-relief agencies to reject the stigma associated with public policy activism. Though its education and grantmaking, MAZON has pushed the anti-hunger and Jewish communities to grapple with ultimate aims; in other words, how to promote not just charity, but also change.